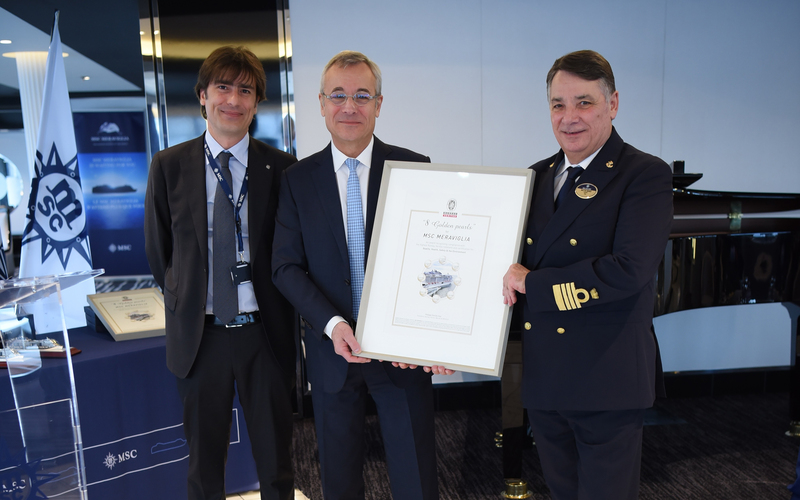 Geneva, Switzerland, 26 March 2018 – Leading international classification society Bureau Veritas has recognised MSC Cruises with the ‘8 Golden Pearls’ award for sustainable and environmental stewardship on board its ship MSC Meraviglia. The award is one of the highest globally recognized notations assigned to cruise ships for the attention paid to Quality, Health, Safety and Environmental management. 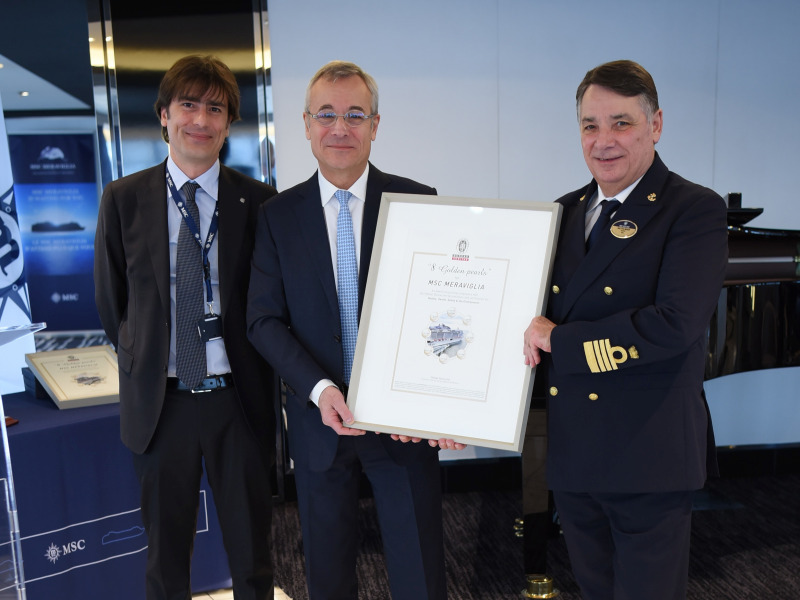 MSC Cruises is the first cruise line to receive the 8 Golden Pearls award from Bureau Veritas. Since she came into service in June 2017, MSC Meraviglia has been making waves in the cruise and tourism industry, and has been collecting prestigious awards for her superior product. The ship has been recognised for bringing to the sea some of the very latest advances in customer-centric technology, digital innovations and new guest experiences. In addition to this industry-wide recognition, the ship is now also awarded for her state-of-the-art Quality, Health, Safety and Environmental (QHSE) management. The ship is equipped with an Exhaust Gas Cleaning System that removes sulphur oxides from the ship’s exhaust gases. Thanks to this system, she meets stringent international and local emissions regulations. An Advanced Waste Water Treatment system treats waste water to a very high quality by mixing different waste streams together and filtering out the undesirable components, to produce high-quality effluent. In addition to the waste water treatment, the ship has a holding capacity and Non-Discharge Operation of two days allowing for more autonomy and more flexible navigation. State-of-the-art technologies and energy-saving materials contribute to effectively lowering the environmental impact of the ship, and improve her energy efficiency. The ship’s ISO 50001 certification is a proof of her efficient energy management. The Company’s commitment to safety and creating a safe environment for crew and guests has earned the ship OHSAS 18001 certification. This notation recognises the Company’s efforts in establishing a comprehensive occupational health and safety management system. For its comprehensive and coherent environmental management systems, the Company has earned the ISO 14001 standard. MSC Meraviglia, was the Company’s 13th cruise ship to join MSC Cruises’ fleet on 4 June 2017 and the first new-built vessel to come into service under MSC Cruises’ EUR 10.5 billion investment plan for growth. This plan aims at increasing the global fleet to 24 cruise ships by 2026, reaching a total capacity of 5 million guests annually. The ship has been sailing her inaugural summer and winter season in the Mediterranean. On 18 April 2018, she will set sail from Genoa to spend the summer season in Northern Europe, home-porting from Hamburg and calling attractive locations in the North Sea, the Baltic Sea, the Norwegian Heritage Fjords, all the way up to the Arctic Sea, exploring Cape North and the Svalbard Islands. MSC Meraviglia is 315 metres long, 43 metres wide and 65 metres high, measuring 171,598 GRT. She is able to travel up to 22.7 knots and has been designed to operate in all seasons and to be able to call in most of the world’s international cruise ports.